Located in Parma, Ohio, Tri-C's Western Campus opened in 1966 in the former Crile Veterans Hospital. One of four traditional campuses of Cuyahoga Community College, the campus' original facilities were replaced in 1975 with a six-building interconnected complex centered around a three-story glass-roofed galleria. The campus has oversight of the Brunswick University Center and serves southern Cuyahoga and Medina County residents. The Western Campus offers a rich mix of direct-to-job and transfer programs. Campus programming includes numerous health career programs. Students also benefit from industry-standard laboratories and learning environments such as the Advanced Automotive Technology Center and the Visual Communication center. For students who cannot attend daytime classes, the Western Campus offers an Evening/Weekend Associate Degree. Most recently, the Campus opened a regional Public Safety facility featuring both credit and non-credit classes and training for first responders. Each year more than 12,000 credit and non-credit students take courses at the Western Campus. 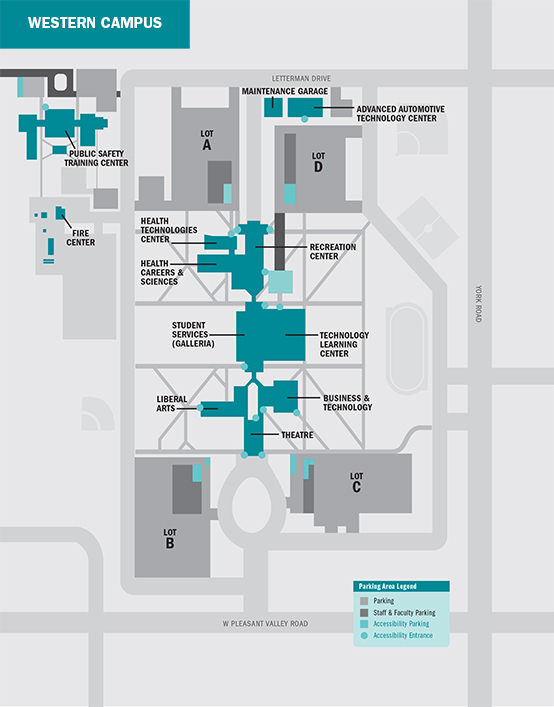 Tri-C's campus locations are easily accessible from major roads and highways. Click here to download direction.